This one turned out so so great. The quilting was done by a local quilter and she did such a good job doing all of that free hand! It gives this simple pattern so much personality. This quilt was a mixture of prints (I blogged about the quilt top here) and the back was pieced from a few large pieces I had leftover of the Good Life collection from Robert Kaufman. That fabric is the perfect shade of green. I stuck this on my son’s bed to see how it looks…and it fit! Well good enough anyways…it could probably use one more row at the bottom. Unfortunately it only got to sit there a minute before it was packed and shipped away…which is OK since little boys + white quilts don’t mix and match so well. so cute! i have my kaleidoscope all pieced together. i am off to girls camp so you will have to wait until thursday for the BIG reveal! i seriously love it! I can see why they wanted you to make another…it is a beautiful pattern! NICE quilt! 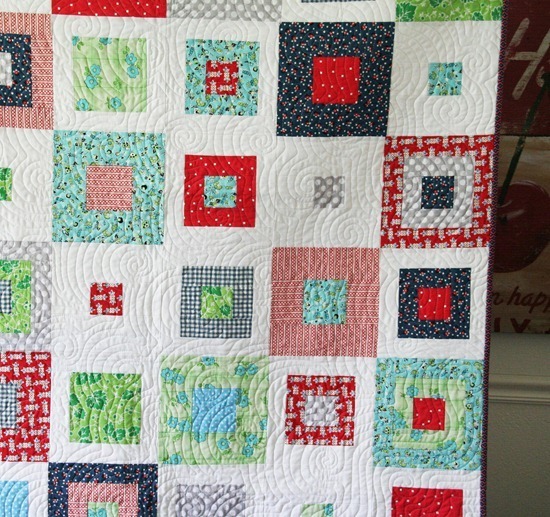 Both the quilt & the quilting are lovely! I love it! You always pick the best fabrics! Just used my coupons at Joann's for three of those yummy Denise Schmidt fabrics. Love them! You're right the quilting really makes it! Oh, that's cute!!! CUTE CUTE CUTE!!! Hi! I've been searching for a quilt pattern to use for my queen size bed. I was over at Fat Quarter Shop and saw Skipping Squares and instantly knew it was the one I wanted! I love love love it! The fabric I am choosing to use is older and I can only find it in layer cake and no fat quarters are available anywhere. The pattern says I need fat quarters. Can this pattern be made with 10" squares? Thanks so much! I prefer your blue and red interpretation. Making quilts for boys can be tough–and there are so many great pink options out there. But you always have such fabulous combination. Thanks for the inspiration. love your quilt and I have been wanting to make a squares quilt. So pretty. I really like the use of dark and light in this quilt. This is a great quilt! I'm thinking I'd like to give this pattern a try for my hubby's fishing memories quilt. this is so cute. i love the colors! That dark blue makes the quilt sing! This is such a lovely quilt. Love the combination of colours! Free hand?!?!!! That is some crazy talent! Perfect finish to a fabulous quilt. Love it on your son's bed. Too bad it was a short stay. :-) I'm all for you starting that new one. I think it looks like fun! I like your quilt much better than the one from FQ Shop!!! So there!! Gorgeous. I need to learn how to do that freehand pattern~love it! Thanks for the inspiration! The kit is already on my list, it looks fab! Sigh. Love it. Your work is always very beautiful. Thanks for showing it. That's great! I'm getting ready to start on a wedding quilt, and think this might be just right for a gal who describes herself as "not that classic"–she's a sparky, lovely, funny woman who deserves a quilt that will make her smile. Thanks for the inspiration. i love how you used your DS fabrics! so pretty and refreshing! That is an amazing quilt—the fabrics and the quilting make it PERFECT!! I'm happy to report that my skipping squares quilt is at the quilters as we speak! The top has been finished for months, and I finally pieced together the back yesterday (I didn't have enough of the original backing fabric). I can't wait to get it back!! We are moving my daughter into a "big girl" bed soon, and hopefully the amazing quilt will ease the transition! ;) Right?! I love it! I love the colors/fabrics! Very nice, great quilting! fabulous quilt! and that freehand quilting is amazing! This quilt is amazing. I love the fresh colours and the block setting! 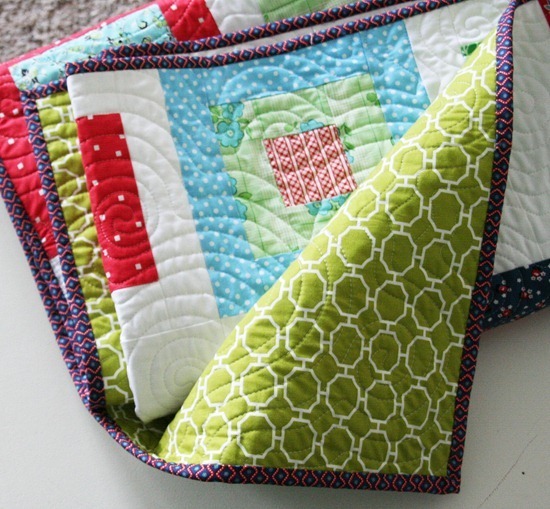 The quilting is very surprising and complementing too! I've never seen the circa 1934 fabric! I love it and it look fabulous in your pattern! Such a great pattern. And it is so cool in the circa 1934 fabric–can't wait until it is available, and your pattern is the perfect showcase. 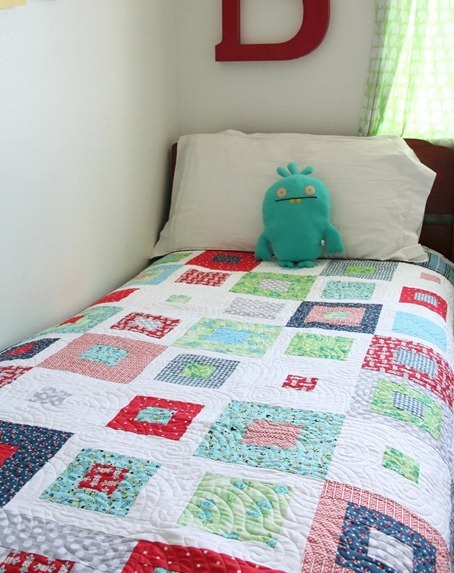 I love this quilt…but I want that huge letter on the wall…can you divulge where it came from? I need it for a gift for a special person….